As you can see from the frame covered in capped brood, the bees have been busy. The flowers are slowly appearing in a steady procession of color. Last year I carefully wrote down the bloom dates of many plants around our yard, so this seems a good time to start this up again. I created a new page for this, and have an update on my spring goals as well. Last March was cold, and a year ago I had no bees. We were finishing bee school and I had just assembled my Langstroth hives. The Cherry Blossoms in Washington, DC were delayed past original expectations, and our first daffodil flower appeared on April 10. This year the weather is overly warm, I have so many bees that I feel a little intimidated, and the flowers are appearing in force. The Cherry Blossoms are predicted to arrive as soon as March 18, and our first daffodil bloomed on March 10. So we appear to be running a month ahead. So, allow me to introduce a new page: Bloom where you are planted. This is a picture record of blooms in our yard. We have enough space and enough flowers for a single page, so I’m ignoring the various trees that just bloomed at our neighbors and around the area. Check it out and let me know what you think. I did manage to check the hives this week. The top bar hive is a pleasure; I photographed the brood-covered frame at the top of this post on Wednesday. 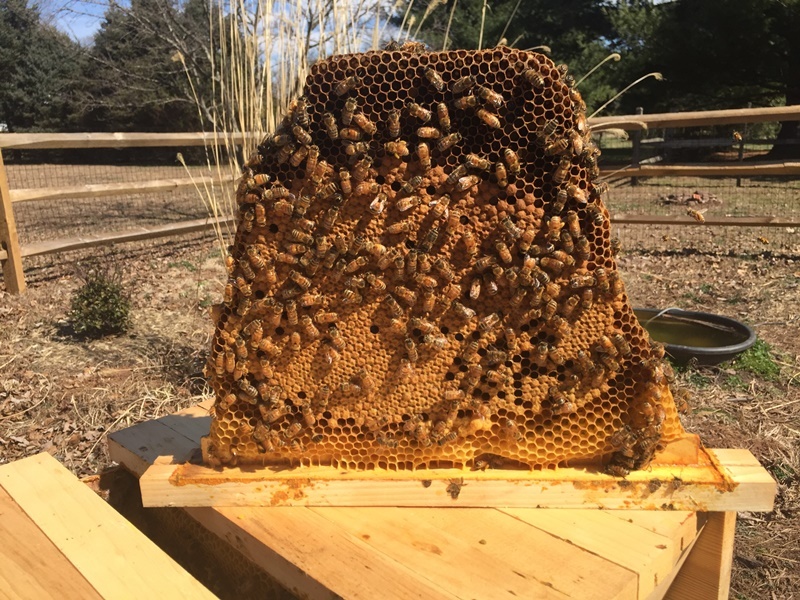 I removed the follower board to open up the back of the hive for the bees, and pulled a single frame from the midst of what I thought would be the brood nest. I estimate at least 1500 workers emerging from this frame in the next 10 days. A quick inspection, and I was done. Yesterday was about 60 degrees, just warm enough to open up our two Langstroths and see how they are faring. Full of bees like the top bar, although unfortunately I could not just grab a frame from the middle of the hive. They were not too happy to have their homes torn apart, either. Let’s all give “Three Cheers!” for bee suits. Huzzah! The top box (a medium) in both hives has six to seven frames of capped honey, so they wintered well. There are also at least three frames with capped brood in both boxes below this honey. I was a little dismayed by the boxes, frames, and bees, and forgot to take any pictures. I did manage to keep my smoker lit the whole time, which I still consider an accomplishment. In Mars, a deep and two mediums, the brood is in the middle medium box and the deep frames at the bottom are fairly empty. In Jupiter, a deep and one medium, the brood is in the deep box. Both hives had some pollen and nectar, in the midst of and near the brood, which I’ve read can sometimes be a sign of swarm preparations. This early spring is really cutting into planning. I ordered everything I needed except frames and foundation. Just plum forgot. I placed an order this past week which I’m hoping will ship soon and arrive by next weekend. I know this is a busy time so it could take longer. That leaves me with a single 8-frame medium box with empty frames in the interim. One of my goals this spring is to catch one hive pre-swarm, and leave the other for honey production. If I manage to catch a hive with built-out queen cells, then I will split both hives to create two one-deep hives. Mars and Jupiter will then be composed solely of medium boxes, another goal for the year. I also have two slatted racks for the hives, which in theory will help with air flow and encourage the queen to lay in the full medium frames in the bottom box. Painting hives on the driveway. Given my limited resources, I think my best bet is to expand the brood nest on one hive to try and delay swarm preparations. Mars seems the best choice since it already has more space. I’ll try to expand this week and let Jupiter move into swarm preparations. 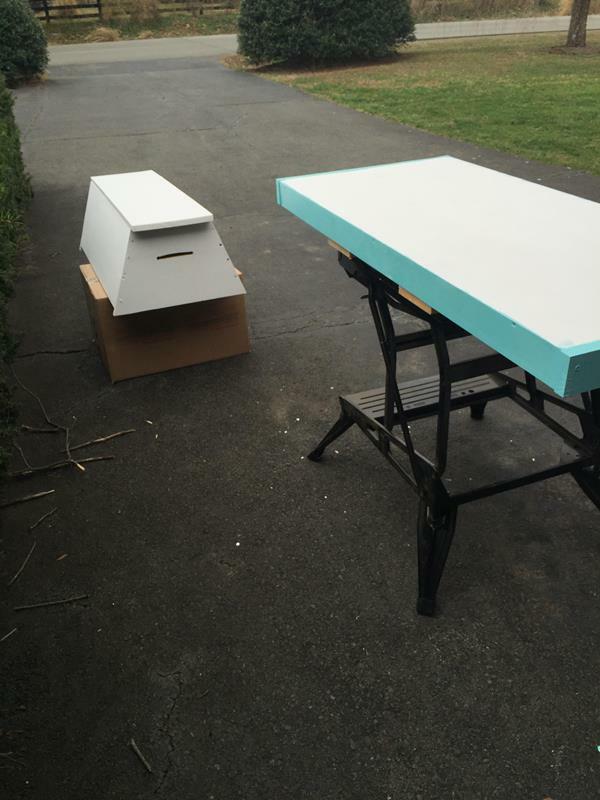 I also have my new top bar hive to get ready, which I started painting this weekend. I’m looking forward to it, although I’m not confident on exactly how to move comb from my smaller top bar hive to the larger one. I know the theory, I just need to get up the nerve to actually try it. We also had a bee club meeting this past Tuesday, with the timely topic of preparing for spring. I enjoyed seeing the material and talking with other beekeepers. 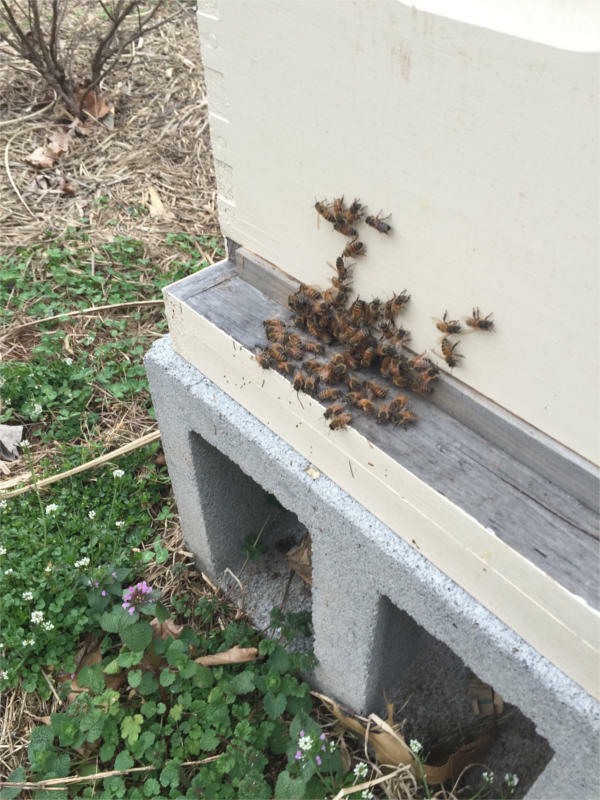 Our club is pretty focused on Langstroth hives, perhaps rightly so. Another beekeeper and I have decided to create a Top Bar Hive Interest Group, or at least try to do so. We have our first planning meeting on March 29 if you are in the area. Please join us at the Central Community Library of Prince William County, Virginia from 7 pm to 8:30 pm. Our title today comes from my new favorite book, The Facts on File Dictionary of Proverbs, and a proverb I had never heard before: It’s not spring until you can plant your foot on twelve daisies. According to the book, this was first recorded in 1863, though was likely in general use before then. It has appeared with various numbers, although always with daisies as the flower. I found this phase online in The Weather Almanac and Meteorological and Rural Handbook for 1865, available on Google Books. On page 13 they quote this proverb and call it an “old saying.” So it has indeed been around for a while. We have yet to see any daisies around here, but the bees are plentiful. I’m not really planning to step on any, just thought it would make a good title. Hope you are enjoying warm weather and lots of bees. Do you find that the bees visit the daffodils and magnolias much? I have read that bumbles like daffodils as they use up their pollen quickly, but that honey bees avoid them because they tend to store their pollen for longer and daffodil pollen becomes toxic when stored. Also I thought magnolias were mainly beetle pollinated. I have seen honey bees on them but wonder if that was in desperation. I have not actually seen bees on the daffodils. Everyone quotes them as a bellwether of spring build up so I look out for them. I think (?) I saw bees on the Magnolias last year, will have to pay closer attention this year. I don’t think they were desperate, though you never know. We’ve had rain for a couple days so the bees are huddled up. Will keep a look out. Apparently daffs have a natural defence toxin, an alkaloid called lycorine. I do keep an eye out but have never noticed any honey bees on them. Your bees sound like they’re doing great! So happy for you! Spring planning is so much fun! Ha! Yes, not stepping on the bees – at least not on purpose. I always love spring, though it is almost too early this year. I feel behind already as I haven’t finished painting my equipment and am short on frames. The hives do seem to be doing well. Two of them are Russians, which everyone says are prone to swarm. I’m hoping to catch them in time, we’ll have to see.